Your Removable USB Drive is already full and you urgently need to carry some important data in it. Usually, you will format the Flash Drive or select/Copy all the data and Paste it to some folder in the hard disk. Instead of doing this, try Flash Backup. Flash Backup is easy to use, open-source software specially designed to create USB flash disk’s backup copies. 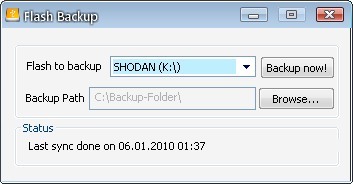 Just click on “Browse” button and specify the folder where you want to store the backup. Select the Removable USB drive and click on “Backup Now” button. All the files and folders of your Flash drive will get synced to specified folder in your hard drive.